This is an exciting week for my little university. We’ll be hosting Neil Degrasse Tyson (you know, from television?) on Wednesday for a talk. The upcoming event reminds me that I’ve been trying to get around to writing about funding space exploration for years now. Not that the subject hasn’t been written about extensively (as if some of my other subjects haven’t as well – were you expecting another piece about ISIS?). Tyson himself has talked and written extensively about the NASA’s budget. 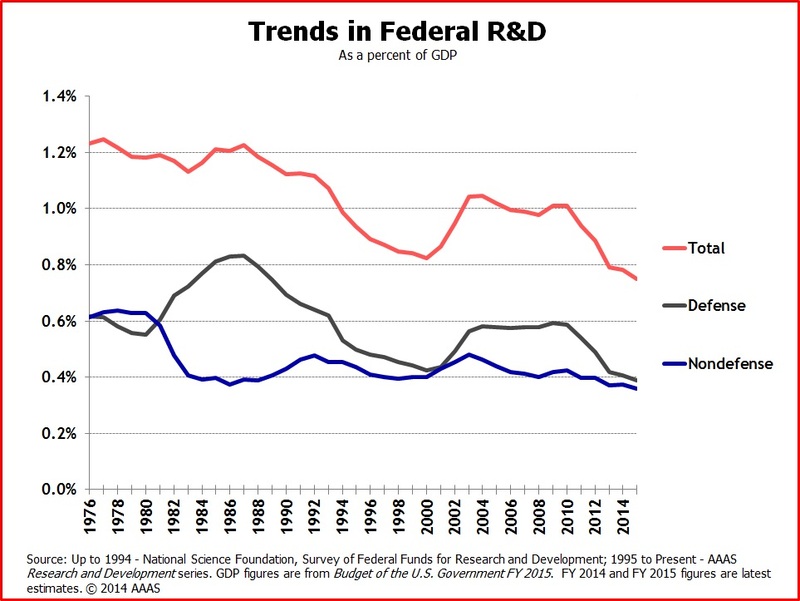 First, let’s address the idea that the US government is slashing research funding, particularly for NASA. Right now the U.S. government budget for NASA is a bit over 17 billion dollars. That sounds like a lot of money, but it’s about 0.5% of the budget compared to almost 4.5% of the US budget during the heart of the “space race” in 1966. Nevertheless, in inflation-adjusted dollars, it’s more or less what NASA’s budget has been since 1971. NASA’s budget represents about 10-15% of the total of 135 billion dollars spent by the government on research and development this year (about 3.5% of the budget). Is that a lot or a little? I’m not sure, but I can guarantee that every scientist and spokesman invested in particular fields receiving that money wishes they had a bigger slice of the pie. Perhaps the real problem isn’t the size of NASA’s slice, as much as it is the size of the pie. If we look at research and development spending as a percentage of the budget over recent decades, it looks relatively flat. However, since the federal budget has declined slightly relative to the size of the US economy, federal research and development spending has also declined slightly as a percentage of the overall US economy. Still, it is a bit deceptive to argue that R and D spending as a percentage of the economy is only half of what it was in 1970, as one famous commentator likes to note, because it’s been at a fairly stable level since 1971 rather than continually trending downward. Federal spending on science is in any case one of the most efficient uses of public funds, because so much of it pays for itself. Spending on disease prevention saves medical costs down the road, and new technological discoveries can add many times more value to the economy then the research underlying them cost. Oftentimes private industries are simply laying the final bricks in a endeavor built upon earlier public funding of basic scientific research. All of this cost-benefit analysis, however, gets away from Neil Degrasse Tyson’s favorite point – that space exploration isn’t simply a good monetary investment, but also an investment in the human spirit. Everyone has to decide for themselves if they would like to fund “unprofitable” space ventures like seeking out new alien life, discovering how the universe came about and evolved, and discovering all the glories oddities that exist out there now. Democracy, fortunately, allows us to decide together how much of our tax dollars to invest in our collective curiosity. As for me, sure, I’d rather a billion dollars were spent on further research into, say, spinal cord injury research and treatments, instead of NASA. Everyone probably can think of something they’d like to see a billion or twenty billion spent on instead. Everyone, however, doesn’t have our same individual priorities, while NASA’s efforts invariably yield discoveries that benefit all humanity. Rather than thinking of things we might rather see NASA funding spent on, perhaps it’s best remind ourselves of other things we spend money on that may be far less worthwhile. The best thing about funding space exploration to me, in the end, is that the knowledge that is learned is essentially eternal, outliving everyone. I might not have existed yet when man landed on the moon, but I’m really glad it happened. I find it satisfying to know my tax dollars are going to something that will enrich all future generations yet to come. How many things do we spend our money on that you can say that about? Posted on October 17, 2014, in Uncategorized. Bookmark the permalink. 1 Comment. Nice piece, Doug. You may not know (and I probably never told you) that my last speech in Speech 101 at Penn State was about the benefits to society and technology that we receive from investing in space and related research. That was in September, 1962. The message continues to be the same. It has been relayed by different folks over the years to changing audiences. There are still enough believers out there that keep the money spigots flowing even though at a rate much less that some of us believe is needed.